So last night, after finishing up my daily cooking quest, I went to buy the Worg Tartare and Fish Feast recipes thinking each would cost 3 dalaran cooking awards. Worg Tartare down, one recipe to go. What's this!? Fish Feast is 5 cooking awards? And it requires 450 cooking? Oh noes. I'm only at 437. To prepare the the fish feast cooking in the morning, I then had to venture back out to catch some Mussleback Sculpins (luckily it uses Arctic Salmon and Nettlefish too, and I had those left over). I fished up the requisite amount, killed a couple of worgs for my Worg Tartare and went to sleep, waiting for the daily the next morning. 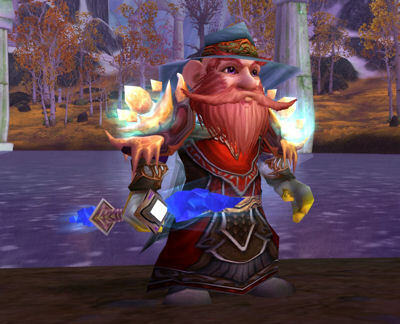 So early this morning I awoke to Infused Mushroom Meatloaf and luckily had just 2 chilled meats left, I gathered the mushrooms quickly, got my 5th dalaran cooking award, bought the recipe and was rewarded with Chef de Cuisine, and then cooked up 4 fish feasts for The Northrend Gourmet and, of course, Hail to the Chef! 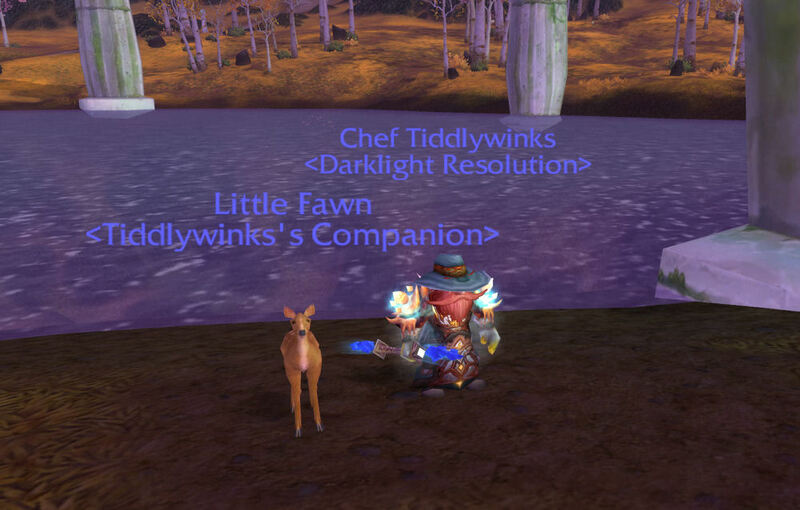 Here I stand on the shore of a peaceful lake in Crystalsong forest with my latest pet, the adorable fawn (reward from Lil' Game Hunter achievement for 75 pets). As an additional bonus last night, while briefly perusing the lists of achievements, I found two new ones! Pest Control requires you to go around all over the world to slay pests such as maggots, beetles, spiders, and roaches which was quite time-consuming, especially since I couldn't find a larva for the life of me. I went into Naxxramas, but couldn't find one without going past some enemies, so I went back to the Ghostlands, where after about 10-15 minutes of running around searching for them, I finally found one. The other achievement is a follow-up to To All The Squirrels I've Loved Before entltied, To All The Squirrels Who Shared My Life. Similar to the "loved before" achievement, you have to go around and /love a bunch of critters - most of them scattered through Northrend, but a couple in some more obscure places. After a quick loop of Northrend, I went over to the Swamp of Sorrows to find a toad and got the achievement. With the Chef achievements this morning, I hit 4,700 points exactly!